Press Room » FSCJ Artist Series Announces 2018/19 Season! FSCJ Artist Series Announces 2018/19 Season! The FSCJ Artist Series, sponsored by Vystar Credit Union, is thrilled to announce the 2018-19 Broadway in Jacksonville season, filled with award-winning blockbusters and family favorites. The FSCJ Artist Series, sponsored by Vystar Credit Union, is proud to announce the 2018-19 Broadway in Jacksonville season, filled with award-winning blockbusters and family favorites. Next season’s lineup will feature Broadway in Jacksonville’s debuts of Waitress and Andrew Lloyd Webber’s new high-octane hit The School of Rock, along with Les Misérables and Rodgers & Hammerstein’s The King and I. All performances will be at the Times-Union Center. Waitress - Inspired by the beloved film, WAITRESS tells the story of Jenna, an expert pie maker who dreams of a way out of her small town. A baking contest and the town’s new doctor may offer her a fresh start, but Jenna must summon the strength to rebuild her own life. Don’t miss this uplifting celebration of friendship, motherhood, and the magic of a well-made pie. School of Rock is a New York Times Critics’ Pick and “AN INSPIRING JOLT OF ENERGY, JOY AND MAD SKILLZ!” (Entertainment Weekly). Based on the hit film, this hilarious new musical follows Dewey Finn, a wannabe rock star turned substitute teacher who transforms a class of straight-A students into grade-A rockers. It features 14 new songs from ANDREW LLOYD WEBBER, all the original songs from the movie and musical theater’s first-ever live kids rock band! Season tickets to the FSCJ Artist Series’ 2018-19 Broadway in Jacksonville Season, sponsored by Vystar Credit Union, are on sale now, with four-show package prices starting at just $159. Season ticket prices vary depending on the show time, day of the week and seating location. A renewal brochure and invoice has been mailed to current FSCJ Artist Series subscribers and should arrive within the week. Current subscribers can renew online with no seat changes at fscjartistseries.org, or by calling (904) 632-5000 or (888) 860-BWAY, Monday through Friday, 10 a.m.-5 p.m. Current subscribers may also mail their invoices to the FSCJ Artist Series Box Office, 501 W. State Street, #109, Jacksonville, FL 32202. Upon renewing, current subscribers have the opportunity to request changes to their seating location. In addition, current subscribers who renew before May 8, 2018 will be rewarded for their loyalty and continued support with an additional savings of $10 off per season ticket subscription they renew. New subscribers can order their season tickets to reserve their seats for all four shows long before single tickets are available to the public. New subscriptions may be ordered online at fscjartistseries.org, or over the phone by calling (904) 632-5000 or (888) 860-BWAY, Monday through Friday, 10 a.m.-5 p.m. Subscriber benefits include: guaranteed package pricing, access to the best seats in the house, priority access to purchase additional tickets for friends and family, seat locations, exchange privileges, free lost ticket replacement, access to other FSCJ Artist Series events- many at a discount. Groups of 10 or more are eligible to a discount on tickets to most shows. To receive the best pricing, reserve your group tickets before June 8, 2018. Groups may begin placing reservation requests at this time by calling (904) 632-5050 or emailing groupsales@fscjartistseries.org. 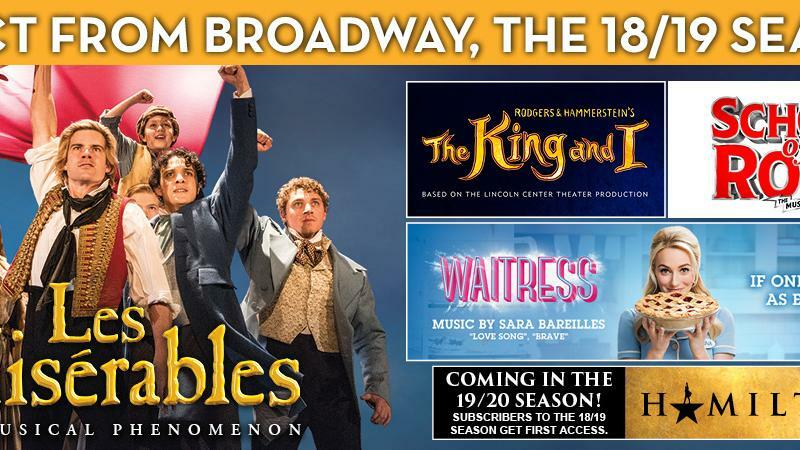 Performances for the FSCJ Artist Series’ 2018-19 Broadway in Jacksonville Season for Rodgers & Hammerstein’s THE KING AND I and LES MISÉRABLES are Tuesdays through Thursdays at 7:30 p.m., Friday and Saturday evenings at 8 p.m., Saturday afternoons at 2 p.m. and Sundays at 1:30 p.m. and 7 p.m. WAITRESS THE MUSICAL will not have a performance on Sunday evening, and SCHOOL OF ROCK will not be performed on Easter Sunday for both the matinee and evening performances. Subscribers may choose alternate performances at the package price with no additional cost. The FSCJ Artist Series is a member of the Broadway League and is the Professional Cultural Arts Presenting Arm of the Florida State College at Jacksonville. Copyright 2018 FSCJ Artist Series. All Rights Reserved. Jacksonville, FL. If you have trouble accessing this page and need to request an alternate format please contact the box office at (904)632-5000 or email info@fscjartistseries.org FSCJ Artist Series is not responsible for tickets purchased through third parties and will not be held responsible for or provide exchange or refund services for tickets purchased through third party sellers. In order to make sure our patrons receive the absolute best prices, we do reserve the right to refuse sale to anyone we suspect is a third-party vendor, scalper, or ticket broker. Any tickets detected to be bot purchases, third-party vendors, scalpers, ticket brokers, patrons creating multiple accounts or any action that is in violation of our current ticket policies, may be cancelled without notice.